Harvester termites taking plant material into the nest. (c) Georg Goergen/IITA Insect Museum, Cotonou, Benin. Reproduced from the Crop Protection Compendium, 2005 Edition(c) CAB International Publishing. Wallingford, UK. 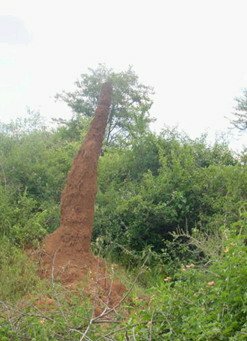 Termite (Macrotermes jeanneli )mound at Marigat, Kenya. Ancistrotermes spp., Amitermes spp., Coptotermes spp., Macrotermes spp., Microtermes spp., Odontotermes spp., Pseudacanthotermes spp. white ants, mchwa (Swahili); Harvester termite (Hodotermes mossambicus); Bark-eating termites (Macrotermes spp., Odontotermes spp.). Termites are probably present in most, if not all, African countries. Termites primarily feed on wood, but some species collect green grasses and seeds and store these in their granaries inside their nest as food reserves. They are sporadic pests, and locally are important on a wide range of crops. Some termites eat into the taproots of young plants (e.g. cotton and groundnut) immediately below the soil surface, destroying the central root portions, and fill the resulting cavities with soil. Damaged plants wilt and may die within a few days particularly under drought conditions. Some termites also attack the roots of maize and sorghum, and the damaged plants topple. Termites may also travel up through the roots into the trunk and branches. They eventually disrupt the movement of nutrients and water through the vascular system resulting in death of the plant. Soil-covered tunnels built by termites on a mango tree. 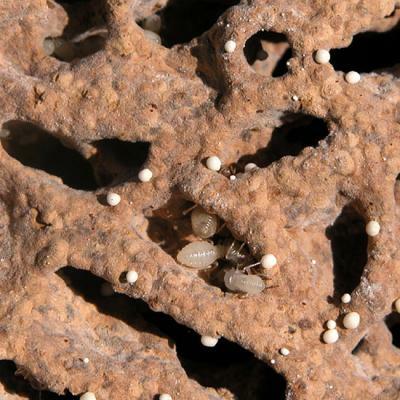 Bark-eating termites attack a wide range of crops and occasionally are locally important pests. They cover the tree trunks or plant stems with tunnels built of soil, plant fragments and saliva and gnaw away the bark underneath these tunnels. Some damage is done underground to the roots and underground stem of the plant. The collected plant material is taken back to the nests for construction of fungal gardens. Tunnelling damage may kill seedlings or ring-bark trees when large cavities are eaten out of the trees. However, they do not cause damage when feeding on the dead bark of established trees. Sometimes root damage may be serious. 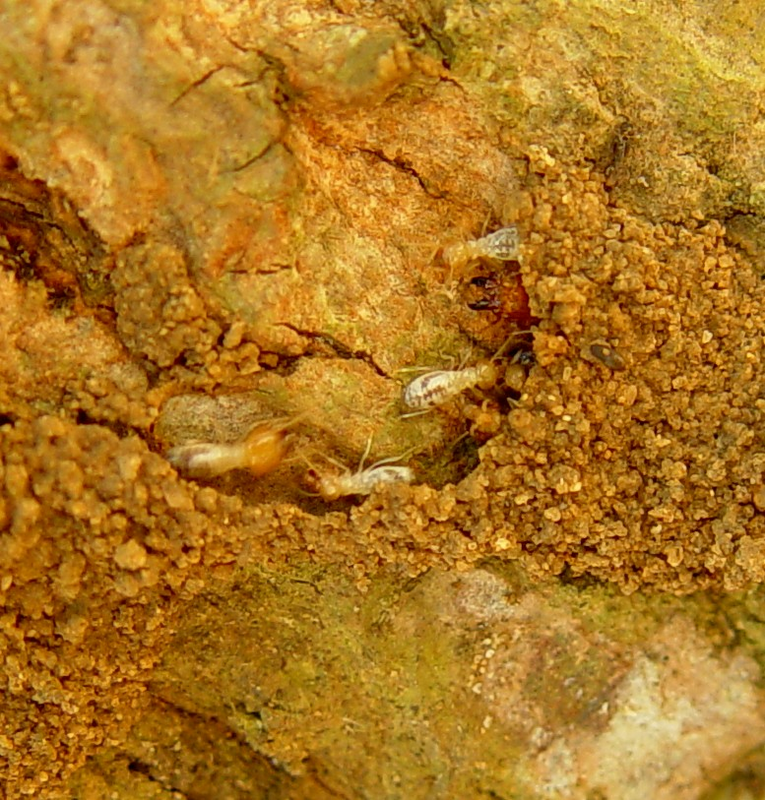 Some termites gain access through the dead ends of pruned branch stumps, from which they may invade the living tissues. The sugarcane termite (Pseudacanthotermes militaris) causes poor germination of sugarcane setts, and when it attacks mature cane, the can is encrusted with earthen tunnels and stalks are often felled when nearing maturity. This termite is a major pest of sugarcane in East Africa. Other species of termites can also cause considerable damage to sugarcane; under severe attack no shoots can be formed and large gaps are left in the field. Harvester termite carrying a piece of plant material to the nest. Harvester termites cut and gather pieces of grass and wood, leaf and herbaceous twigs and carry them to the mounds. They have small earth mounds (about 10 cm) scattered through areas with short grasses. They are major pests of grasslands, and occasional pests of cotton, wheat and groundnuts. Several species of dry wood and subterranean termites are storage pests and can become a problem in farmers' granaries or in village stores. Most of the damage occurs in wooden storage structures, but some subterranean termites also feed directly on the stored grain. Direct grain losses due to termite feeding are generally low, but contamination with moulds, as a consequence of their attack, is frequent. Hosts include: Cotton, maize, wheat, sugarcane, upland rice, potatoes, sweet potatoes, groundnuts, soybean, coffee, cassava, tea, cocoa, rubber, oil palm, coconut, some vegetables, some fruit trees like; mango, papaya, citrus, etc. The first signs of termite attacking roots on seedlings or older plants is wilting. Eventually some plants die or fall over. Pulling out the affected plants and examining the roots and lower stem for live termites and tunnelling will confirm the presence of termites. Plant roots and stems may be completely hollowed out and soil-filled. Often plants in the field are covered with soil runways or soil sheeting, under which termites may be found. It is important to examine plants in the early morning or late evening, as termites may have moved deeper into the soil during the day when temperatures are high. Termite attack on trees and bushes often begins in an area of dead wood produced by pruning or other damage. Small cracks or tunnels made by other insects such as wood-boring beetles may allow winged termites (reproductive stage) to enter. Termites may also travel up through the roots into the trunk and branches. They eventually disrupt the movement of nutrients and water through the vascular system, resulting in death of the plant. Galleries in the wooden parts of the construction reveal the presence of drywood termites in granaries. As termites avoid the surfaces of attacked wood, their presence may only be detected after substantial damage has occurred. 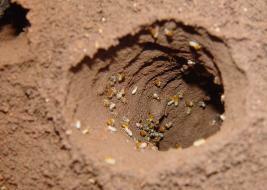 Subterranean termites construct visible galleries that are used as runways. 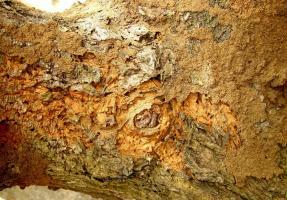 Termite damage on mango tree bark. Flowering stage, fruiting stage, post-harvest, seedling stage and vegetative growing stage. Leaves, roots, stems and whole plant. Termites are social insects, living in large colonies consisting of many workers, soldiers and reproductive forms. They live sometimes in elaborate nests, some build nests on moist dead tree stumps, while others build subterranean nests, which in many cases have mounds that may reach 2 m in height. They forage away from the nest protected through underground tunnels or under soil-covered tunnels. Termites feed on dead plant material, such as wood, leaf litter, roots, dead herbs and grasses, dung, and humus. Some termites are able to digest cellulose (wood) with the assistance of symbiotic (mutually beneficial) bacteria present in the gut of the termites. Other termites use the cellulose to cultivate fungi that are then eaten. A termite mound in a mixed cropped farm in Kenya. Eggs hatch into tiny larvae, which are incapable of feeding on their own and are raised by specialised workers of the colony. Larvae are capable to develop into any caste (workers, soldiers or reproductive forms), depending on time of year, diet etc. Workers are whitish, wingless and usually blind. They have pale yellow round heads. They comprise the bulk of the population. Workers feed all the dependent castes. They also dig tunnels, locate food and water and build and repair the nest. The soldiers are whitish, wingless and blind; they are larger than the workers and have large, brownish heads and strong jaws. With their specialised defensive weaponry, the role of the soldiers is to protect the colony against numerous predators such as ants and centipedes. 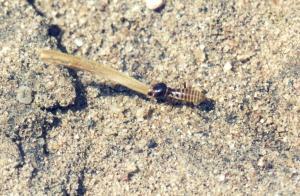 The reproductive termites are winged and are known as alates. Numerous winged males and females, generally dark in colour and with well-developed eyes, are produced for swarming. Swarming is often at dusk after the onset of heavy rains. After flying, they shed off their wings, mate, and burrow into holes in the soil and cracks in wood to found a new colony. The queen termite typically develops an enormously distended abdomen. At her peak, a queen will be laying an egg every 3 seconds or 30 000 a day in some species; and she will lay tens of millions of eggs during her life. Further below you find concrete preventive and curative methods against Termites. Promote conditions for healthy plant growth to prevent termite damage. Termites more often attack sickly or water stressed plants than healthy plants. Plough field to destroy termites' nest, runways, and tunnels and to expose them to predators, such as ants, birds, chicken, etc. Practise crop rotation to reduce the build-up of termites. 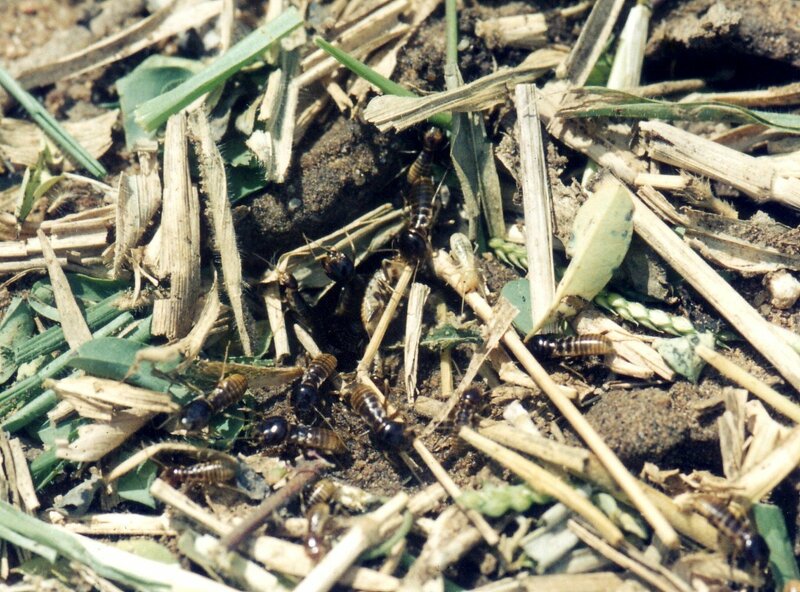 Planting the same crop every cropping season makes it susceptible to termite attack. Grow crops in mixed cropping systems to lessen termite damage. Know and make a list of the annual crops that are attacked by termites. Remove plant residues and other debris especially moist and decaying woods. However, take into account that termites may attack plants if there is no other food available, for instance if there are no other sources of organic matter such as soil humus and mulch; therefore ensure there is plenty of soil humus; avoid bare, dry disturbed, organic-deficient, residue-free soil. Inspect plants, especially the pruned fruit trees, for termite attack. Do this either early in the morning or late in the afternoon. Remove affected plants or part plants, and kill the termites; they are normally found inside the hollowed parts. Harvest at the right time, as termites often attack maize, sorghum and millet left in the field after maturity. The attacked stalks may fall down and the termites may attack the cobs and panicles. Where there is risk of termite infestation, avoid leaving the crop in the field after harvest on, stacks or windrows. Termites are attacked by a wide range of natural enemies including man. In Africa masses of reproductive forms are caught in simple traps and eaten raw or roasted in oil. Natural predators include ants, dragon flies, ground beetles, some spiders, bats, many kinds of birds, frogs, and some large mammals (aardvarks, pangolins and monkeys). Despite the large number of predators, most termites are able to maintain high populations by means of mass production of reproductive forms. Biological control measures against termites are generally difficult because of their social nature and secure enclosed environments that protect them against most natural enemies. Preparations based on insect-attacking nematodes and the fungi Beauveria bassiana and two species of Metarhizium are effective when applied into the mounds. Fungi spores can act as repellents. 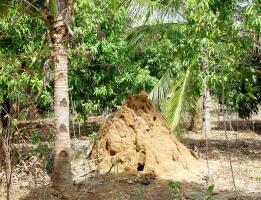 Neem products reportedly have a repellent effect on termites. Odontotermes spp. and Microtermes obesi were repelled from scarifying groundnuts pods lying in heaps on the ground, by a layer of neem cake between the surface of the soil and the pods (Gold et al, 1989). Neem oil and neem leaves reduced the weight loss of wood pieces exposed to termites (Sharma et al, 1990). Neem seed extracts have been used against Microtermes termites on trees and Odontotermes termites on field crops with good results (Schmutterer, 2002). Heaping wood ash around the base of tree trunks or mixing it into seedling bedding soil is reported to reduce termite attack. Wood ash should be replaced regularly. Burn plant residues on top of termites' mound to suffocate them. However, this does not give long lasting results, as it does not penetrate deep enough to kill the queen. Locate their soil runways/tunnels and destroy the worker termites either by hand tilling or by flooding. This is not a long lasting solution since the termites would eventually re-infest the plants. Destroy termite mounds manually. However, this method is labour intensive since the building material of the mounds is very hard, and some mounds are large. To be effective the queen has to found and destroyed; the queen maybe hidden deep inside and is not easily found. After killing the queen, pour boiling water or burn dried grass straws (any plant debris) to kill the rest. Clear the building site for the granary from all organic material that might attract termites, such as wood and straw. Dig out roots of chopped trees and shrubs that have been left in the ground close to the storage structure. Keep the ground around the building free from any plant growth. Avoid construction sites that are infested with termites or are close to such areas. Use termite resistant timbers (e.g. teak) as poles for granaries. If termite resistant wood is not available, protect the poles by charring the outer layer of wood or by coating the poles with engine oil. Pour used engine oil, wood ash or pounded neem leaves or seeds into the pole holes in order to repel termites. Use concrete or stone platforms resting on poles made out of same materials as basement for grain stores. In areas where termites occur regularly, avoid placing granaries directly on the ground and using mixtures of clay with straw, because termites are encouraged to tunnel thought he walls. Use pure mud walls instead. Underground pits are easily invaded by termites; To avoid this, line with clay or soil from termite mounds, which is then fired to harden. Apply a layer of ash to the base of the granary, or plant materials with insecticidal or repellent properties to the grain. GTZ. Integrated Termite Management in Grain Storage. GTZ and German Federal Ministry for Economic Cooperation and Development (BMZ). Gold, C. S.; Wightman, J. A. and Pimbert, M. (1989). Mulching effects on termite scarification of drying groundnut pods. Int. Arachis Newsl. 6, 22-23. HDRA. 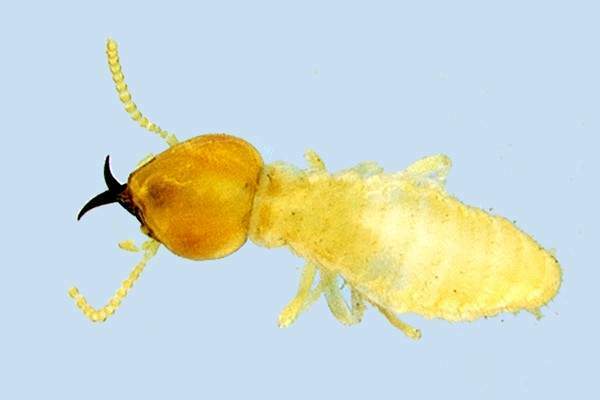 Henry Doubleday Research Association, UK: Termite Control without Chemicals. To view document click here or refer to page on "Publications". Hill, D. S. Agricultural Insect Pests of the Tropics and their Control. Second Edition. Cambridge University Press. ISBN: 0-521-24638-5. Kranz, J.; Schmutterer, H. and Koch, W. (1977). Diseases, Pests and weeds in Tropical Crops. Verlag Paul Parey. ISBN: 3-489-68626-8. Schmutterer, H. (2002). Effect on Viruses and Organisms; Isoptera: Termites. 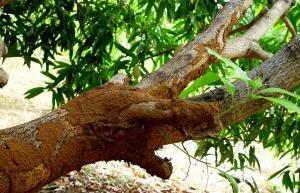 In 'The Neem Tree- Source of Unique Natural Products for Integrated Pest Management, Medicine, Industry and Other Purposes'. Second Edition. Edited by H. Schmutterer. pp. 320-321.